Now you know how to play Move cards to provide Move points. Next, let's explain how to spend them to move your figure across the map. 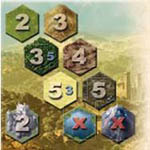 The Move cost of each terrain type is depicted on the Day/ Night board, represented by the large number. A red "X" means that this terrain is inaccessible. Ignore the small blue numbers for now; they are for Night Rounds. To move your figure, you must spend Move points provided by cards you have played. You can move to any space adjacent to your space unless that terrain is inaccessible. You can move as far as you want, as long as you have enough Move points to do so. The following diagram shows three examples of movement from the starting position, and their Move costs. Note: When moving into an adjacent space, you pay the Move cost of the space you are entering. The terrain of the space you are leaving does not matter. You can freely pass through a space occupied by another figure but you should not end your move on that space as this would count as an Attack on another player. While this may be useful in some situations, we recommend that you do not use Player vs. 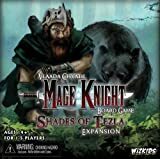 Player combat during your first game. (If you decide otherwise, you will have to read the Player vs. Player section of chapter VIII). If you are not allowing Player vs. Player combat then ending your move on a space with another player is not allowed. If, for any reason, you decide to not to move from the portal, or if you return to the portal on a later turn, remove your figure from the map and place it in front of you on the table. No figure can stay on the portal space once a turn is over. Your figure stays in front of you until your next turn, when you return it to the portal space. Note: Any number of Heroes can occupy the portal space at a time, since they are removed from the map when they do. Heroes that are taken off the map cannot attack each other. You cannot enter a space occupied by an undefeated rampaging enemy. Moving in the vicinity of a rampaging enemy is dangerous! If you move from a space adjacent to a rampaging enemy to another space adjacent to the same enemy, it is provoked and attacks you. This immediately ends your movement, and you have to fight as a mandatory action (see Combat). 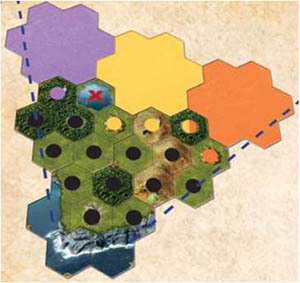 Both red and violet move paths would provoke the wolf riders to attack, since you would be moving from one space adjacent to the wolf to another that is also adjacent. The violet move will not even be finished - the attack immediately ends the movement after the first step, and the unused Move points are lost. The red movement brings you to a village, but then you will have to fight there. Since combat uses your action for the turn, you would not be able to interact in the village this turn. The green move path can get you to the village without provoking the attack, it just costs you more Move points to go around. On a subsequent turn, making the move shown by the yellow path is okay. Since you are moving from a space adjacent to an enemy to a space adjacent to another enemy, neither of these enemies are provoked. When you are standing on a spot that borders empty table space, and if that empty space is not behind the extended coastline from the Starting tile, you can explore the land. Reveal a new tile and add it to the map. Exploring is not an action, it is done as part of movement. To explore a new tile, you have to pay 2 Move points. If you do, reveal the top tile from the Tile deck, and add it to the map. The orientation of the tile is determined by the symbols in six of its corners (they have to match the symbols on the already placed tiles), and by the direction of the art on the tile (it has to match the direction of numbers and graphics of the already placed tiles). If there are two tiles that could be revealed from one space, the player has to announce which one he is exploring before he reveals the tile. Take a look at the diagram. No new tiles may be explored from the spaces marked by black dots (either because they do not border an empty space, or because they border empty spaces behind coastline only). The purple tile may be revealed only from one space (because the lake is inaccessible). The yellow tile can be explored from three spaces, and orange from two spaces. Note there is one space from which both the yellow and orange tile can be explored - a player standing here may reveal one or, for 4 Move points both, but he has to clearly say which one is he exploring each time he draws a tile. "The First Reconnaissance" scenario has one special rule - every time a player reveals a new tile, he gains 1 Fame. It is an exploration mission, after all. Thus for each tile you reveal, immediately move your Shield token on the Fame track up by one. If it crosses the end of a row, the level of your Hero increases at the end of your turn (see the Level Up section in chapter VIII). You may continue movement even after exploring a new tile. You may even play additional cards to add more Move points to those leftover from the cards already played. 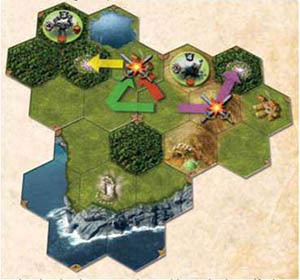 A player plays three Move 2 cards, giving him a total of 6 Move points. 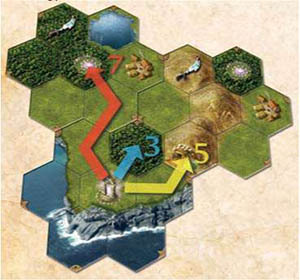 He moves one space into a forest (which costs him 3 Move points), and then explores a new tile for 2 Move points. On the newly revealed tile there are now hills next to his current space. He still has 1 Move point left, so he needs to play another 2 Move points worth of cards to move into these hills. However, you are not allowed to change or modify cards that were played before exploring. In our example, it is not possible to get those additional 2 Move points by powering one of the already played cards with mana. 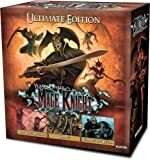 So, a player can do as much traveling and exploring during his movement phase, as long as he can pay for it with Move points. It is possible to only explore on your turn, without actually moving, if you start your turn next to an unrevealed place. However, it still counts as movement, so it has to be done before you take an action (combat or interaction), and only on a Regular turn (not when Resting).